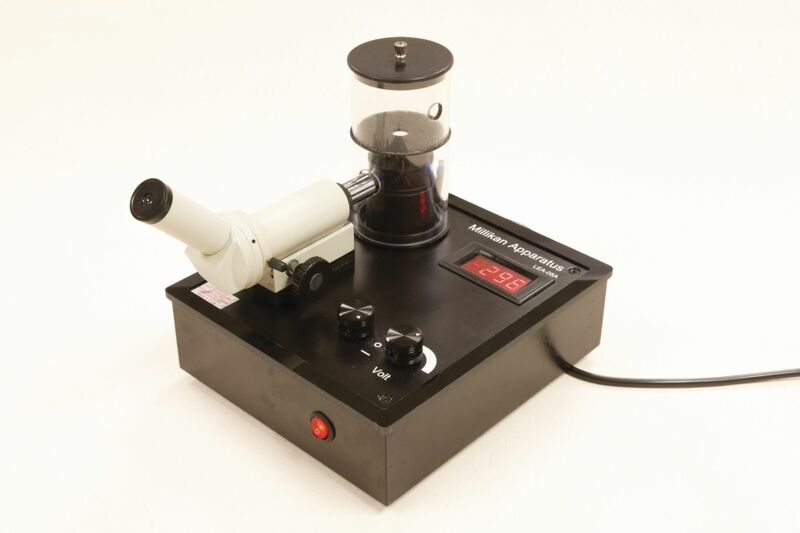 Determine accurately the elementary charge of the electron and demonstrate quantization with this classic apparatus. It features a whole–plate reversible polarity electrode chamber, which provides a completely uniform field, and a high intensity LED light source, which is fully adjustable for background contrast and beam focus, to illuminates particles brilliantly. The focus can be adjusted to either coarse or fine through the short depth–of–field viewing scope with reticle and individual particles of the particle cloud may also be scanned. Includes the base unit with integrated 500V supply, high intensity LED light block, parallel whole–plate field chamber, viewing scope with reticle, focusing rod, atomizer, latex sphere suspension and an experimental manual.